Ex Blyth and Berwick Leyland Lion KW1961 of 1927 joined the fleet in early 2010, more detailed on this vehicle can be found on the restoration page. The vehicle escaped being commandeered by the German Army during its occupation of the Channel Islands, because the owner removed the differential and hid it away, thus rendering the vehicle immobile. After the cessation of hostilities, the diff was replaced thus allowing the vehicle to be returned to service and remained with SCS until the company was sold to the J.M.T., ( Jersey Motor Transport Company Ltd) in November 1946 and Plated as B130 by the J.M.T. on17/10/1947 hence the green interior. She was withdrawn on 15/05/1953 being sold to a Mr.Perry then to the late Jack Le Gresley of La Rocque in the parish of Grouville before eventually being purchased for preservation by Mick Giles of Gaminglay, later passing to Simon Emerton of Nantwich. The vehicle was bought by Greg Lawson in 2007 and hopefully will be restored sooner rather than later. 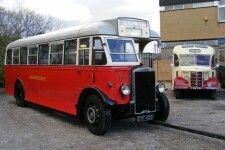 CTF423 is a Leyland Tiger TS8, which is powered by a Leyland 8.6 litre engine, with a 30 seat body made by Charles Roe at Leeds. Buses like 114 which entered service in 1938 were familiar all over LUT territory from Liverpool to Manchester and from Warrington to Wigan or Bolton. They might be used on a workers service to a colliery on one day and sent on express to Leeds the next. During the shortages of the war years many LUT single deckers had their seats arranged to be around the perimeter of the saloon to allow room for more standing passengers. Like many survivors of this age, 114 was used as a staff bus for a building contractors until it was bought for preservation. 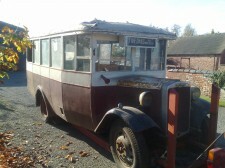 The bus has been kindly donated to the group by Mr Roy Marshall for continued preservation. 114 has been stored since 1981 and since the group received the vehicle much mechanical and electrical work has been carried out, a repaint will be carried out shortly. NHN128 was originally ordered by United Automobile Services as a 39 seat single deck bus with a Gardner engine, and given the fleet number BG 460. As UAS thought that it would like some larger vehicles to replace 31 seat Bristol Ls on express duties, a number of LLs were converted to express specification by taking the dual purpose seats out of the short Ls, placing them in the LLs, and replacing the Ls seats with the bus seats from the LLs. 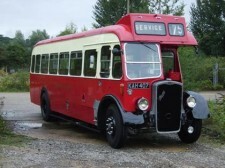 It was found however that only 33 seats could be fitted in an LL, which hardly made the conversion worth while, but, nonetheless, a number of vehicles were converted. NHN 128 became fleet no BBE 1 and was used on express duties until 1961, by which time more modern underfloor engined vehicles were available in greater numbers. The decision was taken to reseat the BBEs back to buses, using seats from earlier vehicles, thus when withdrawn from service in 1966, it had seats of a type from earlier Ls with wooden grab rails to the seat tops, rather than the RT type aluminium seats with which it was delivered. Sold to North''s of Sherburn in Elmet, NHN 128 them passed to Buxted Chickens for use as staff transport at their poultry processing plant at Dalton, nr Thirsk.Purchased by its present owner in 1976, the vehicle has since suffered some vandalism damage but will eventually be restored to its express livery, being one of the only batch of 7'' 6" wide 30'' long LLs to run as such. OWT776M was the last Bristol RELL to be purchased by the National Bus Company, and was allocated to the West Yorkshire Road Car Company on 26th October 1973. 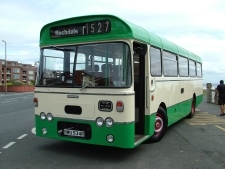 It is fitted with an Eastern Coachworks B53F body and as delivered was powered by a Leyland 0.680 engine. However, in November 1973, the Leyland engine was removed and exchanged for a Gardner 6HLX which came from 1037 in the coach fleet, a Plaxton-bodied Bristol RELH. 1403 was then put back into storage until it entered service on 20th May 1974 at Bradford depot, where it spent most of its working life. After covering 500,000 miles on stage carriage duties, it was finally withdrawn on 31st October 1984 and was the last RELL to operate for the company. West Yorkshire Road Car Social Club at Bradford depot then purchased it for preservation on 10th January 1985. 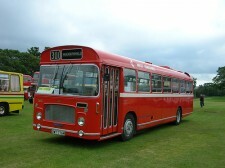 After a repaint with original style white National Bus Company logos being added, it attended many rallies and events in this ownership. After the sale of West Yorkshire to Yorkshire Rider in 1989 (the company being fully absorbed by 1st April 1990), the Bradford Depot Social Club was disbanded. 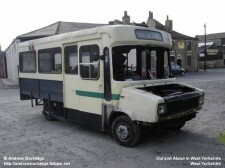 1403 was sold and is now owned by Alex Lawson, the vehicle being housed at the Aire Valley Transport Collection in Bradford. RWU534R. This Leyland Leopard was delivered to the West Yorkshire Passenger Transport Executive in 1977 as fleet number 8534. It was delivered with dual purpose seating in its Plaxton body which it retained until withdrawal unlike some which were downgraded to buses. The vehicle outlived its fellows mainly because it was repainted into Todmorden Joint Omnibus Committee livery to celebrate 90 years of bus operation in the town and latterly became somewhat of a local celebrity being the last Leopard to operate in the area, its use in later days being confined to school duties. B818YKR This minibus was the first to enter service with West Yorkshire PTE at a time when frequent minibus services were seen as a possible answer to some of the problems connected with encouraging the use of public transport.B818 YKR was a demonstrator at the Commercial Vehicle Motor Show for the Dormobile company who built the body on the BLMC Freightrover chassis. As with all of these minibuses, maintenance problems, particular relating to brakeshoe wear, led to a less enthusiastic use of such vehicles, and few companies now use them in large numbers, particularly in well populated areas. After withdrawal, 1701, to use its WYPTE fleet number, was sold to a scout group in the Dewsbury area, from whom it was rescued for preservation by Simon Turner and now owened by Warren McClintock.